The MG logo gets its origin from Morris Garages, a dealer of Morris Cars, which manufactured its own specialist versions back in the 1920's. 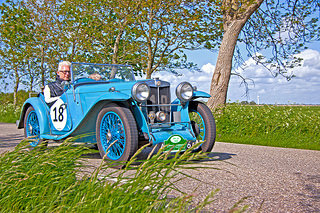 The very first sports car manufactured by the MG Car Company was the MG 14/28 in 1924. It was offered as either a two door, two and four seater open tourer, or a two door coupe. It used a 1.8 litre, side valve engine with a single SU carburettor, later replaced by a single Solex, a three speed manual gearbox, and twelve inch drum brakes. 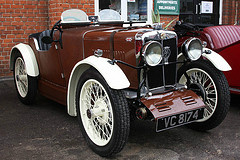 MG badges on all their cars did not appear until 1928. 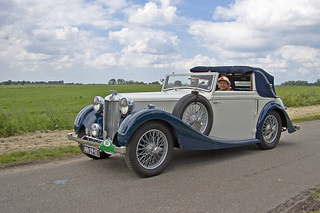 In 1928, the MG 18/80 was launched, and may be described as the first true MG sports car since it contained the distinctive vertical MG grille. It was available in a range of open top tourers and closed body versions. It used a 2.5 litre, 6-cylinder, single overhead cam engine, with two SU carburettors. The twelve inch drum brakes were cable operated. 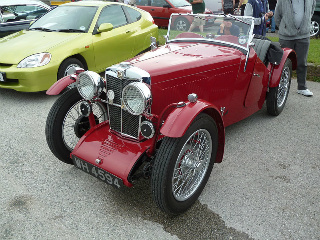 In 1929, the first in a memorable line of MG Midget sports cars was launched with the introduction of the M-Type. Based on the chassis of a Morris Minor, it was a two door, two seater convertible. It used a 4-cylinder, single overhead cam engine, with a single SU carburettor, and a three speed crash gearbox. In 1930, with a modified camshaft, output was increased to 27 bhp, and a four speed gearbox was offered as an optional extra. In 1932, a supercharged version became available with a top speed of 80 mph. Two of these roadsters were entered in the 1930 Le Mans 24 hour race, but neither completed the course. 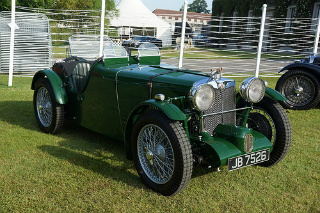 In 1931, the two seater MG C-Type sports car was introduced, based on the M-Type, and with competition use in mind. The tuned, single overhead cam engine, with a single SU carburettor, used a four speed crash gearbox. It used cable operated brakes with eight inch drums. The bodywork included the absence of any doors. In 1932, a version with a cross flow head and supercharger developed 52 bhp. 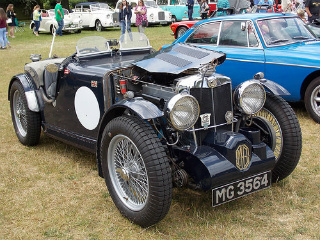 In 1931, the MG D-Type Midget sports car was introduced. It incorporated the engine from the M-Type and the chassis from the C-Type. Interestingly, only a four seater version was available, in both open top and closed versions. It used a single SU carburettor and a three speed crash gearbox, although later models offered a four speed box as an optional extra. Like its predecessor, it used cable operate brakes with eight inch drums all round. 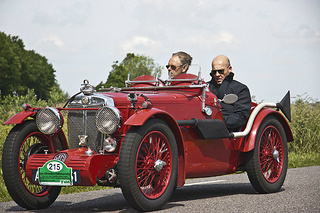 The third convertible to be introduced in 1931 was the MG F-Type Magna sports car, incorporating a 1.3 litre, 6-cylinder, single overhead cam engine. It used two SU carburettors developing 37 bhp, which was later increased to 47 bhp by adjusting the valve timing. It was built to bridge the gap between the 18/80 and the M-Type, and used rear wheel drive and a four speed crash gearbox. The original F-Type sports car was a four seater with eight inch drum brakes all round. 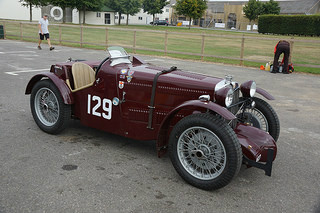 In 1932, the F2 variant was a two seater convertible with twelve inch drum brakes. Later that year, the F3 variant appeared as both a four seater tourer and a coupe. 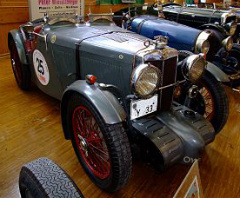 In 1932, the MG J-Type Midget sports car made its appearance. 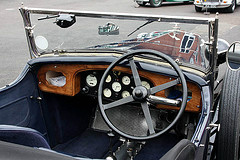 It was a two door roadster that used an updated version of the engine from the M-Type and the chassis from the D-Type. 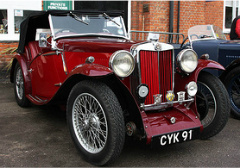 The most popular variant was the two seater J2 with a top speed of 65 mph, although a modified version reached 82 mph. It had a two bearing crankshaft, cable brakes to each drum, and a four speed crash gearbox. The J3, used with racing in mind, had a shorter stroke, 746 cc engine fitted with a supercharger, and larger brakes. The J4 sports car, designed specifically for racing, with a lightweight body and a J3 engine, developed 72 bhp by increasing the boost developed by the supercharger. 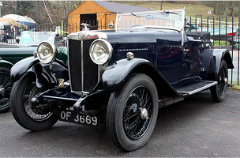 Also in 1932, the MG K-Type Magnette sports car was introduced. It used the engine from the F-Type, whose capacity was reduced from 1272 to 1087 cc, and was fitted with a cross flow head and three SU carburettors. It used cable operated brakes with thirteen inch drums, had rear wheel drive and a four speed crash gearbox. In 1933, a modified version with readjusted valve timing and two carburettors developed 41 bhp. Also that year, another version used a 1271 cc engine with a modified cylinder head and timing, which developed 48 bhp. A 1087 cc engine fitted with a supercharger, built purely for racing, and developing 120 bhp, was fitted to a variant called a K3. 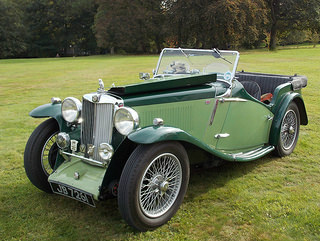 The MG L-Type Magna sports car made its appearance in 1933. It used the same 1.1 litre, 6-cylinder, overhead cam engine as in the F-Type. It had rear wheel drive and a four speed crash gearbox. The brakes were cable operated and linked to twelve inch drums all round. The body had sweeping wings, and was available as a two door, four seater, with cut away doors. 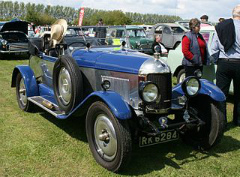 The L1 variant was offered as either a four seater coupe or saloon, whilst the L2 version was a two seater roadster. 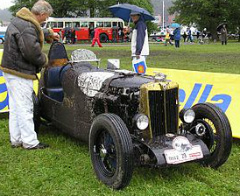 The L-Type had a successful record in competitions, and was the winner of the 1933 Alpine Trial. 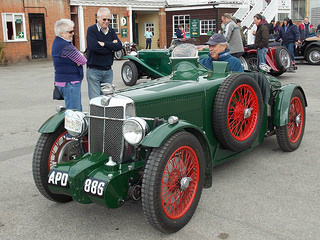 1934 marked the introduction of the MG N-Type Magnette sports car. It used a K-Type engine with a modified block and head, and had two SU carburettors. It was developed from the K and L-Types, but with an improved chassis. It used rear wheel drive with a four speed crash gearbox. 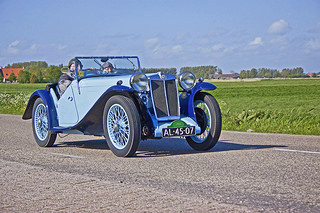 It was, primarily, a two and four seater open tourer, but a small number of coupes were built. This variant was called the NA. 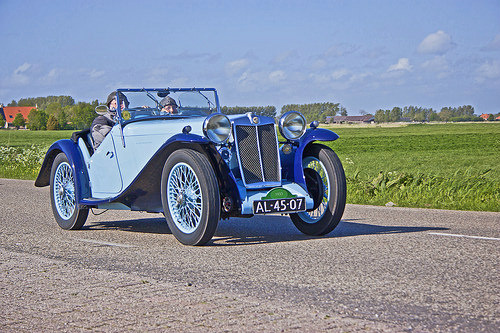 In 1935, the NB version had a modified body with lower lines, and was a two and four seater open tourer. In 1934, the NE version was the competition variant, with a lightweight, two seater body, using a 1271 cc engine further tuned to develop 68 bhp. Also in 1934, there appeared the MG P-Type Midget sports car, a two door, two seater convertible, although a four seater version was available. The initial variant, called the PA, had an 847 cc engine, similar to the J-Type, with two SU carburettors. Unlike its predecessors, it had a three bearing crankshaft and a larger camshaft. It had rear wheel drive and used a four speed crash gearbox. In 1935, the PB version had an engine that was bored out to 939 cc, and developed 43 bhp. 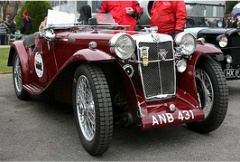 In 1936, a supercharged version of the PB won the Limerick Grand Prix. 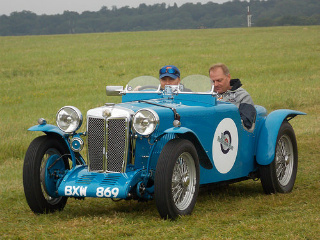 Also that year, the P-Type Midget was replaced by the MG TA, which heralded the beginning of the T-Series of MG Midgets. A total of 2,000 PA's and 536 PB's were built.